You made it! There’s only one more day until the LSAT. Congrats! You’ve put in a lot of hard work studying for the LSAT, so be sure to give yourself a pat on the back. 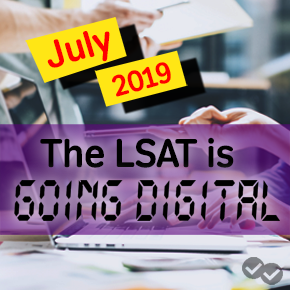 But, don’t let all that studying go to waste—do these final preparations to ensure you do your best tomorrow on the LSAT! Make sure you have all of these Magoosh strategies fresh in your mind for tomorrow. Don’t work any new Logic Games, read any new Reading Comprehension passages, or try any new Logical Reasoning questions. Save all that brain power to crush the LSAT tomorrow. Today, just do a quick review of the Magoosh strategies for each section, and review a few Logic Games, Reading Comprehension passages, and Logical Reasoning questions you’ve already done. The goal is simply to keep your brain active and fresh for tomorrow. Rest easy. You’ve learned everything you can at this point, so don’t try to cram! (If you stuck to our two week LSAT study schedule, you’re all too familiar with cramming!) Think back on all the hard work you’ve put in and review those strategies you already know by heart. Today is about building confidence and resting up for the real LSAT. Don’t forget to bring a printout of your admission ticket with the photo you uploaded to your LSAT online account. This is required in order to be admitted to take the LSAT. Your admission ticket has the time you have to report to the testing site and the exact address for where you need to report tomorrow. Since things can change at the last minute, the Law School Admission Council (LSAC) recommends that you log into your LSAC account to view your admission ticket the night before the exam. If you haven’t done so already, make sure you know exactly where you are taking the LSAT tomorrow and how you are going to get there. Do you know the route you’re going to take? Where you’re going to park? Or if you’re relying on public transit, which bus or train you’ll take? Next, figure out what time you need to wake up that gives you some extra time to get to the test site. The key to tomorrow morning is staying calm and giving yourself plenty of time! Be sure to review of all the LSAC prohibited items and note that the LSAC has a no-tolerance policy on electronic devices. So, leave those phones, digital watches, and fitbits at home tomorrow—they’re not allowed anywhere in the testing center! Do a final review of everything in your bag and make sure you’ve got all of the necessary items, at least a few of the recommended items, and none of the things on the prohibited list. Now, your brain and your bag are packed and ready to go for LSAT test day! After you’ve reviewed the Magoosh LSAT strategies, developed your game plan for getting to the testing center, packed your bag, it’s time to RELAX. Get outside. Take a walk. Watch a movie. Pet your dog. The most important thing you can do now is let your brain rest and recharge. You’ve now done everything you can to succeed tomorrow. All except getting a great night of sleep and, most importantly, waking up on time. Make sure to set at least two different alarms: one on your phone and another on an analog clock (if you have one). And one thing I love to do when I know I have to get up early is set my coffee pot to automatically brew a little before my alarm goes off. If you can, ask a trustworthy friend to give you a ring in the morning just in case. Studies have shown that screen time before bed can interrupt your sleep so be sure to put your phone away, turn off the tv, and switch to a book at least an hour before you plan to get to sleep. You’ve worked so hard to be prepared for tomorrow—make sure you’re up and ready to go! Review Magoosh LSAT Strategies one last time. Map out your route to the LSAT test center. Relax and find a way to unwind. Set your alarm(s) and get some good sleep. Congrats again on all of your hard work and your dedication to succeeding on the LSAT. 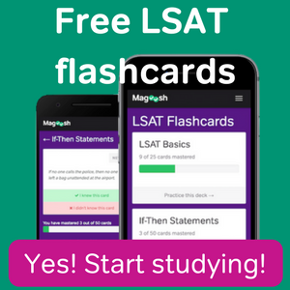 From all of us here at Magoosh, good luck tomorrow—crush that LSAT!